Croquet requires a range of equipment and all of the croquet sets we offer have the equipment needed to allow play to commence straight away. Most croquet sets consist of mallets, balls, hoops and a centre peg with some sets also having optional equipment but fundamentally the most important part is the mallet. Whether you are an experienced player, a beginner or even just wanting to play croquet on a beautiful summer's evening, it is important you have a croquet mallet which suits your needs; not only to be comfortable but also to help improve your play. For example we offer smaller coloured mallets which are often helpful for children and can help them improve and develop their hand- to-eye co-ordination. Looking at the different croquet mallets available can be confusing as there are so many different designs, styles and sizes out there. Working out which mallet is best for you can feel a little complicated. There are several things to consider when choosing a croquet mallet and we have created a helpful guide to try and make the decision easier. 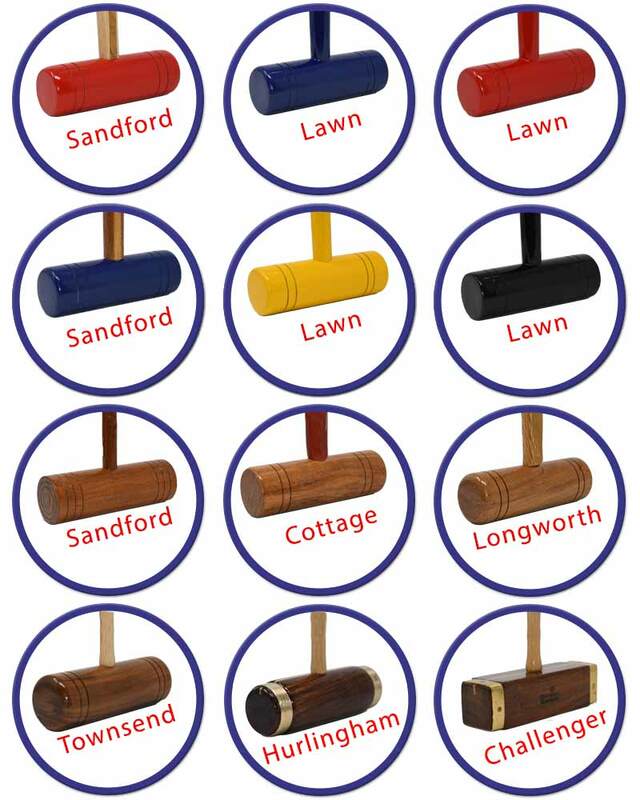 Croquet mallets come in various sizes and it is important to get a mallet which is a suitable length for you. When buying a set one of the main things to consider and research is the size of the mallets included within the set. Often children's croquet sets and family croquet sets offer smaller mallets allowing younger players to join in with the game. Adults find it much easier to play croquet when they have a mallet which is the right height for them and in their preferred style. An easy way to tell which length you require is to stand a croquet mallet against you and make sure that it is at a comfortable height when you have your feet slightly apart. It is a very individual choice depending on how you grip the mallet and how you feel comfortable. Opinions vary with some people preferring a mallet to be just below the hip and some at the same height as their belly button. Some experienced players who have wooden mallets purchase the tallest length available and then gradually cut it down until comfortable. Egyptians tend to play with shorter mallets and they bend a lot during play. Croquet is a popular sport in Egypt and the game is even televised there. We offer a range of croquet mallets in a full size 38" length but also offer some of our mallets in a 34" length allowing everyone to have a mallet which suits them. If playing croquet with the correct size mallet the strokes and play will be improved. Mallets are often made of different materials, most being made of wood but more professional mallets are made of fiberglass or carbon fibre. Most clubs and professional players use either carbon fibre or fibreglass but again it is all down to personal choice and what is most suitable for you. Wooden mallets are made with different types of wood and varies depending on the design and features of the mallet. Some are made up of one wood while others feature two different types to add extra strength and durability to the mallet. Some of our mallets have ash shafts and rosewood mallet making them not only look and feel like a professional mallet but also add durability and quality to the game. Croquet mallet heads can be different shapes and sizes with a variety of embellishments. Mallets come with both square and round heads. Most clubs, professionals and serious players use square headed mallets but there is not a lot of difference between the two. The main reason why square headed mallets are used is that it can be easier to play difficult shots when in play. When playing with a square headed mallet you are able to stand the mallet upright and step back to check alignment. Some mallet heads have added brass branding which not only adds protection to the mallet head but also adds extra strength. The brass banding prevents the mallet head from splitting for long lasting play, adds a little extra weight and adds some timeless charm! Mallets vary in weight depending on what they are made with but the most important thing is that you're comfortable. Most people go for a mallet which weighs between 1.2kg and 1.5kg however it is totally up to personal preference. If choosing a mallet which is significantly longer or shorter then you may want to reduce or increase the weight. The mallet head carries the majority of the weight so the heavier the head, the stronger the shaft needs to be. With a heavier mallet longer shots may be easier; the mallet head helps with the pendulum motion making the shots harder and straighter with a reduced effort. On the other hand when attempting stop-shots and delicate strokes on a fast lawn it is often easier to have a lighter mallet. Different mallets have different grips and shafts which are designed to be comfortable for the player as well as having advantages to play. Most mallets have either a round style of handle or an octagonal handle but the different shapes mostly depend on personal preference. Some mallets have cushioned grips and some just have engraved wooden shafts. Having a cushioned grip makes it more comfortable during play, creates a non-slip surface and helps prevent and minimise the shock when striking the ball.